Nature is around us, but we need a stepping stone to enter that world and understand its wonders. That way, dragon flies and damsel flies are the most suitable keys t explore the wonders of the world. However, they are numerous and are difficult to understand. This is the reason why Indian academy of Sciences has published ‘Dragonflies and Damselflies of Peninsular India - A Field Guide’, as a basic field guide for identifying most common dragon flies and damsel flies seen in different parts of India. The book prepared by famous scholar K A Subramanian, who has made extensive studies on odonates and fresh water biodiversity, was published under the Project Lifescape of IAS in 2005. Just to make it a perfect beginners field guide, it has pictures, and descriptions which help us identify species in a field trip. Moreover, to suit it to any beginner, the electronic version of the book is distributed free also. The book in its electronic version is available in three parts with a detailed introduction which gives a clear idea about different body parts of a damsel fly and dragon fly and also about the terms used in the field guide to describe type specimens of each family. It also keeps detailed illustrations which help any inexperienced dragon fly watcher to get the basics right. As Professor Madhav Gadgil points out in the forward to the book, “If we get to know them (odonates) better, we are apt to become more concerned with their welfare. That, in turn would mean broader support for our efforts to conserve, and prudently use, India’s rich heritage of biodiversity”. We hope the field guide will thus unlock the wonder world of nature for more people through dragon flies and damsel flies, gradually leading them to a broader understanding about the need to conserve the rich biodiversity on mother earth. 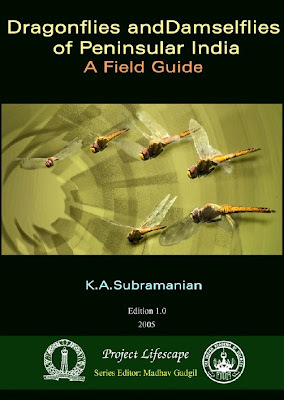 Download PDF files of Dragonflies and Damselflies of Peninsular India - A Field Guide from the link below.